Ultrasport 8 Levels Of Resistance – Magnetic Resistance – Hand Pulse Sensors – Foldable – LCD Display – 95 x 45 x 121cm – 20kg Mid range VIEW PRICE HERE! 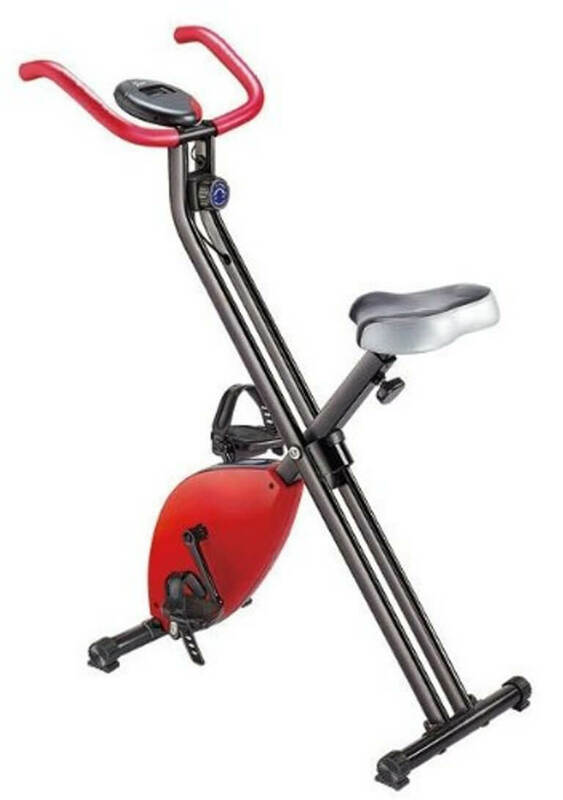 Ultrasport Home Trainer 8 Levels Of Resistance – Magnetic Resistance – Foldable – LCD Display – 80.5 x 43.5 x 112cm – 18kg Mid range VIEW PRICE HERE! 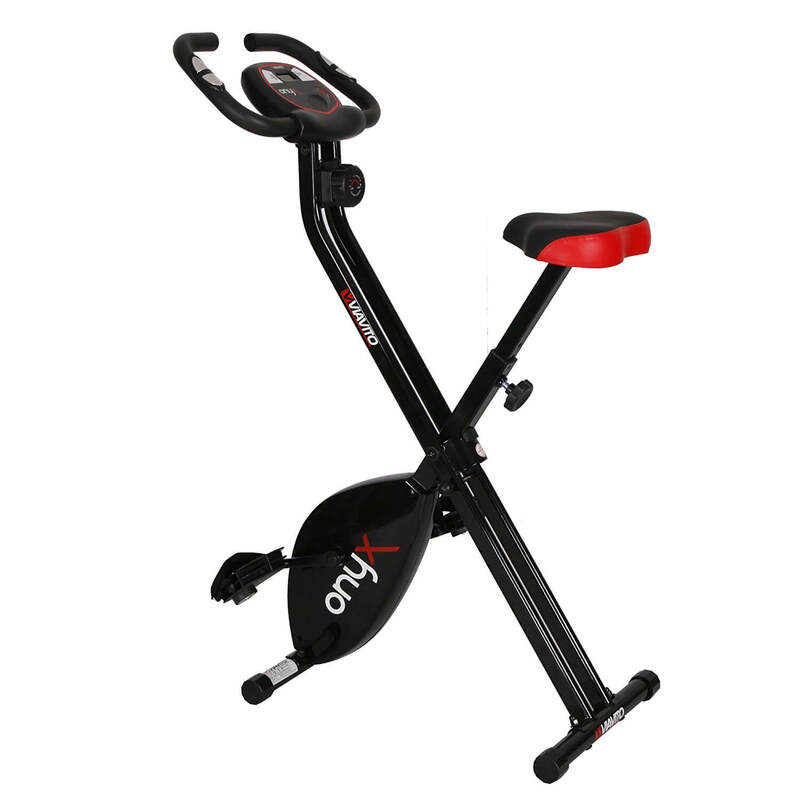 Viavito Onyx 1.2kg Flywheel – 8 Levels Of Resistance – Magnetic Resistance – Hand Pulse Sensors – Foldable – LCD Display – 81 x 42 x 107cm -13.9kg Mid range VIEW PRICE HERE! X Frame Magnetic Resistance – Adjustable Resistance – Foldable – 108 x 80cm – 16.75kg Affordable VIEW PRICE HERE! 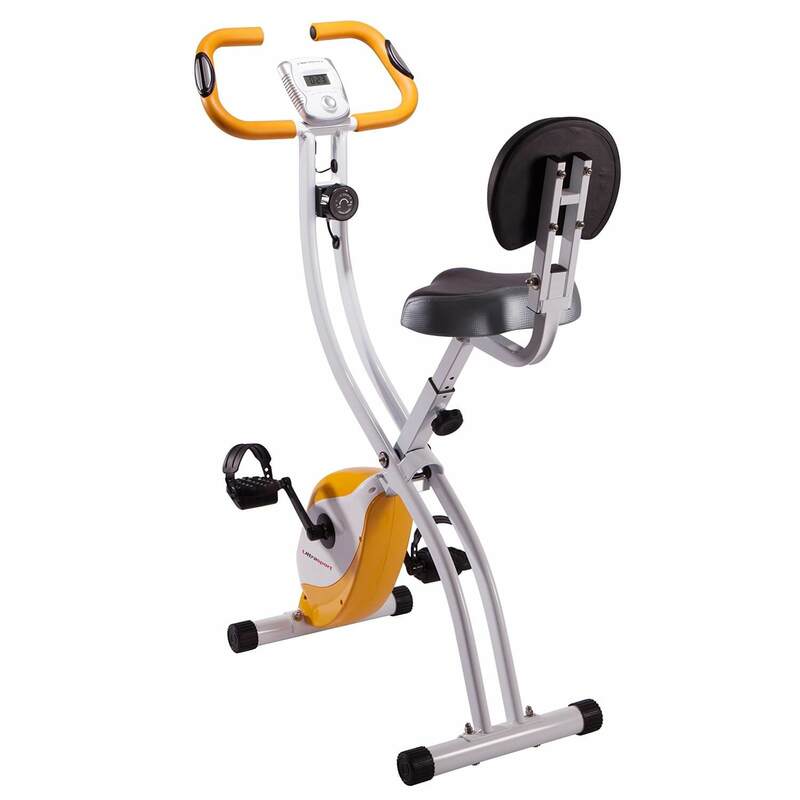 XS Sports 1.6kg Flywheel – Adjustable Resistance – Magnetic Resistance – Hand Pulse Sensors – Foldable – LCD Display – 74 x 113 x 41cm – 14kg Affordable VIEW PRICE HERE! When it comes to staying fit, many people prefer home exercise equipment and few devices are as effective as exercise bikes. These products let you work out your legs, as well as giving you plenty of cardio training. Fortunately, the market has plenty of products, for both beginners and professionals alike. To help you get the best option, here’s a look at the top 5 folding exercise bikes available right now. With 8 levels of resistance, this device offers plenty of options, allowing you to find a setting that’s the best for your workout. Furthermore, the resistance is created through magnetic braking, offering a smooth, quiet experience. There are hand pulse sensors built into this model, allowing you to get a good reading of your heart rate during any session. The device is also foldable, so the trainer doesn’t take up as much space when not in use. Folded up, it is just 36 x 45 x 142 cm. This bike also comes with plenty of settings, all of which can be adjusted through the control panel, complete with a handy LCD screen. Even unfolded, this device doesn’t take up that much space, with a rough frame of 95 x 45 x 121 cm. Likewise, at 20 kg, it isn’t the heaviest piece of equipment either. There’s no problem moving it around. As you can see, plenty of design work has gone into making a product that is easy to use but offers plenty of depth. With simple controls and a variable resistance, this device is instantly familiar to use and is a great addition to any home. With 8 levels of resistance, this is another exercise device that offers plenty of depth and customisation. Similarly, the magnetic resistance ensures all of your workouts are smooth and quiet, making for a comfortable and relaxing experience. This bike is also foldable, so you make it even more compact when you’re not using it. This is a great feature for people short on storage space. When folded up, it has a rough size of just 45 x 47 x 132.5 cm. Likewise, the controls are simple and come with an LCD display for clear information – perfect when you’re trying to focus on working out. This isn’t the shortest piece of equipment but, at 80.5 x 43.5 x 112 cm, it will still fit in your home with plenty of ease. At 18 kg, this is relatively light option and can be picked up and moved around with little difficulty. All in all, this is another great option for any home. It’s small, light and very easy to use, so it can find a use in any apartment or flat. With a 1.2kg flywheel, this is a very powerful bike, able to generate plenty of resistance. This is supported by different settings, allowing you to get the right amount of resistance to get the best workout. Likewise, the magnetic resistance ensures a smooth experience, without brakes scraping against the flywheel or otherwise disrupting your session. This device also has built in hand pulse sensors, allowing you to measure your own heart rate and adjust your exercise accordingly. When not in use, this device folds down to a size of just 33 x 41 x 136 cm – perfect for when storage is limited! As for the controls, these are easy to use and come with a reasonably sized LCD screen, offering all the information you need. When in use, this is still a reasonably sized product, with a size of 81 x 42 x 107 cm. It’s also not that heavy, either. At 13.9 kg, it is much lighter than the typical options in this market. This product is very easy to use and offers no problems when it comes to setting up or putting away. When all you want to do is focus on working out, this ensures that all of your energy goes to cycling, which is always appreciated. This device offers magnetic resistance, so it always feels smooth and gentle to use. If you want a harder challenge, the resistance is adjustable and can be adapted to suit your needs. Likewise, when not in use, this piece of equipment is built around an X-frame. This means it easily collapses into a smaller, portable size. Even when folded out, it’s not that bad. It’s only 80 cm long and, with a height of 108 cm, it will easily fit in most spaces. Similarly, at 16.75 kg, it’s lighter than a lot of other options, offering little difficulty to move or set up. At this price, what’s not to love? The device is small, lightweight and very easy to set-up. This makes it an excellent choice in a variety of situations and very useful for beginners that are curious about starting such training. With a 1.6 kg flywheel, this is a very powerful device, able to generate plenty of resistance. Of course, this resistance can be easily adjusted, allowing you to fine-tune the experience for the best results. Likewise, the magnetic resistance is smooth, soft and exceptionally quiet. Perfect for busy households or quiet evenings. The hand pulse sensors are also a welcome touch. Want to know how well you’re coping? Just quickly check your pulse and adapt your program accordingly. 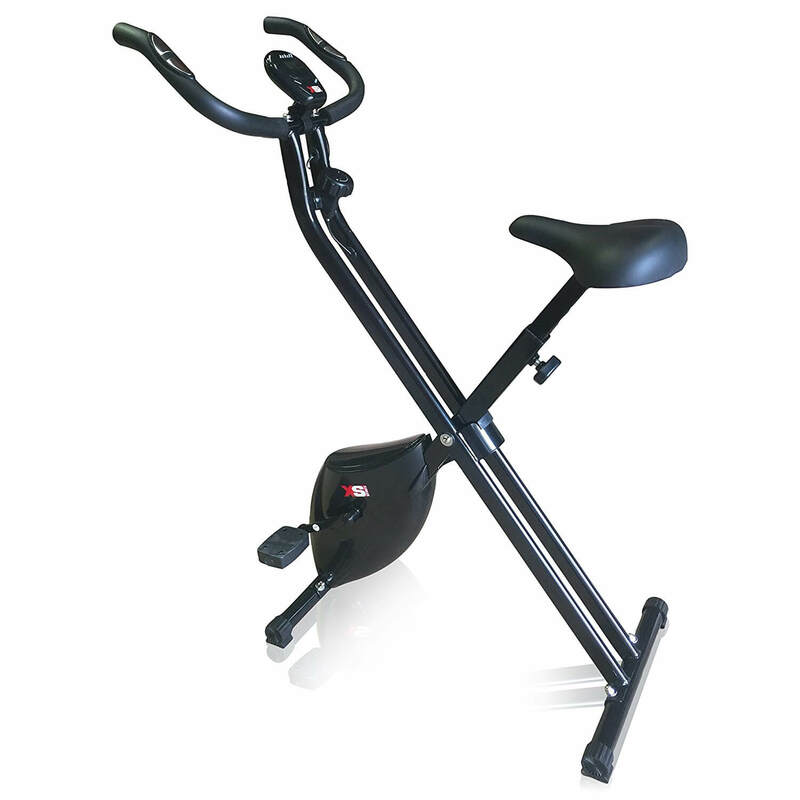 This is also a fold-able bike, allowing you to collapse it up when not in use, which makes it much easier to store. As far as the controls go, these are easy to use and come with an LCD screen, to help display information clearly and easily. In terms of size, this bike has a rough size of 74 x 113 x 41 cm, which fits into any room with relative ease. As far as weight goes, this device weighs in at 14 kg, which is rather light when you consider all of the features, such as the large flywheel, that are included. As you can see, there are a wide range of options, able to meet a broad range of needs and budgets. However, even when looking at the best 5 options, one product stands out from the rest. 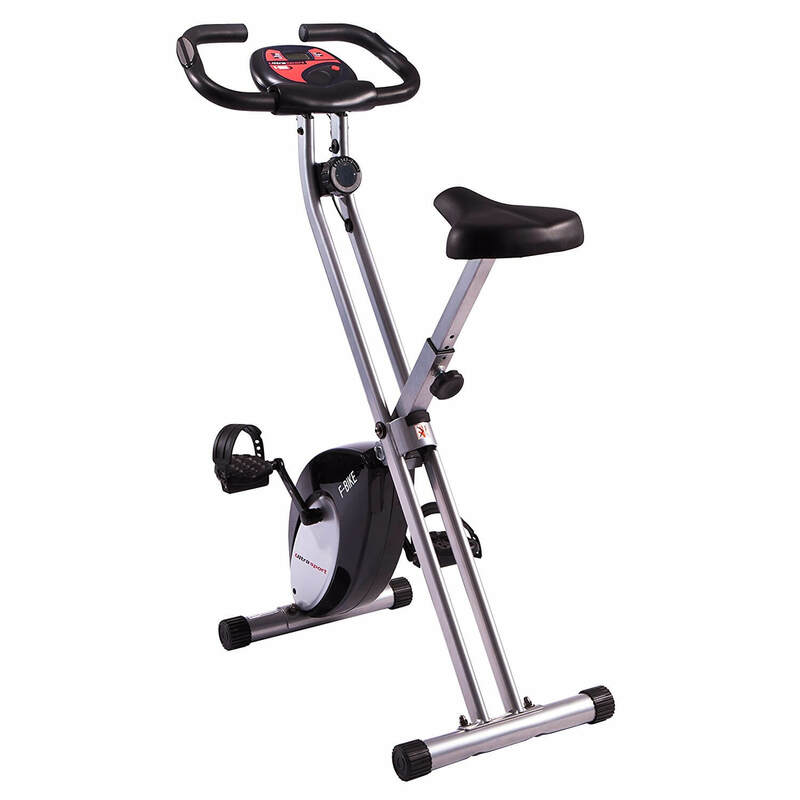 Thanks to its great quality and value, the Ultrasport Foldable Exercise Bike is certainly the best option available, complete with all the adjustable features that anyone could want.